U.S. truck makers, new startups and independent engine manufacturer Cummins Inc. have helped generate the early buzz on electrified trucks, cleaner emissions and less reliance on diesel fuel. Now, that buzz is generating buzz. That buzz includes equipment-related specifics, prototype products and initial field tests — often with an eye on how similar technology overseas is developing, experts said. “They want to take it into production but it all depends on how that market votes,” ACT Research Co. Vice President Steve Tam said. The long-term outlook is good. ACT forecasts commercial electric vehicles will make up a “significant share” of the Class 4 through Class 8 market in 2030 to 2035. As it stands, China, Europe and North America are each at different points in adopting electric commercial vehicles, said Rick Mihelic, president of Mihelic Vehicle Consulting. “Each region can learn from the others but the products, markets and design priorities do differ. Some technology may be directly applicable in all three regions, but it’s more likely they will differ,” he said. Those differences are not just in physical specifications such as typical sizes, loads, speeds, duty cycles, whether trailers have two or three axles, or materials, he said. In our third episode of RoadSigns, we ask: Will your next truck be a plug-in? Hear a snippet from Mike Roeth, executive director of the North American Council for Freight Efficiency, above, and get the full program by going to RoadSigns.TTNews.com. They also will reflect “how [truck makers] view vehicle design life, how they value secondary vehicle markets, how they value drivers. Differences also occur with how the vehicle technologies are incentivized or penalized in each region. All these can affect design priorities and truck maker and fleet investment choices,” Mihelic said. 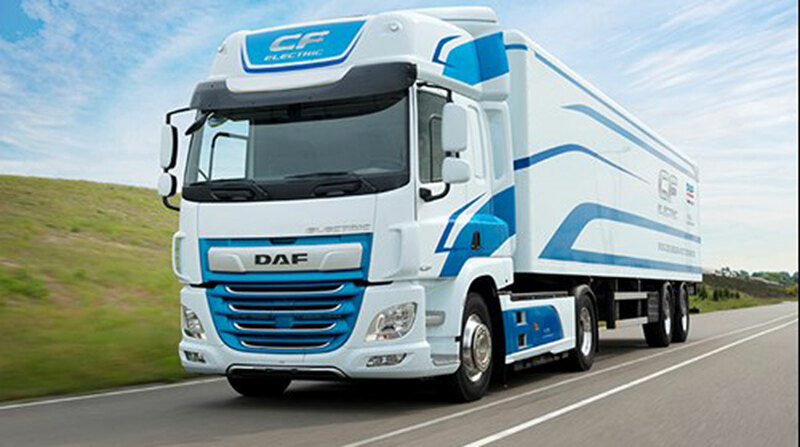 Meanwhile, Bellevue, Wash.-based Paccar Inc. announced its DAF truck subsidiary in Europe will display a battery-electric powered version of its market-leading CF model heavy-duty tractor, which typically runs on diesel, during the IAA Commercial Vehicle Show that will run Sept. 20-27 in Hanover, Germany. The CF Electric has a range of 62 miles (100 kilometers) which is suitable for high volume distribution applications, according to Paccar. Fast charging of the batteries can be performed in 30 minutes, while a full charge can be done in as little as 1.5 hours. The first series of CF Electric trucks will be put into field test operation with customers this year. Paccar is the parent company of the U.S. truck makers Kenworth Truck Co. and Peterbilt Motors Co., both of which also are in the early stages of testing electrified trucks. California has set a goal of having 100,000 zero-emissions freight vehicles in operation by 2035. “I think some of the first product [U.S. truck makers] will bring to the U.S. or North American market will be the electric powertrain based on, or a derivation of, what they are doing in Europe especially with Volvo and Freightliner,” Tam said. Volvo Trucks North America and Mack Trucks are brands of Sweden-based Volvo Group. Freightliner is a brand of Daimler Trucks North America, a unit of Germany-based Daimler Trucks. International Truck, a unit of Navistar Inc., is collaborating on electrification with Germany-based Traton, formerly known as Volkswagen Truck and Bus. At the same time, don’t count diesel out. In fact, efforts to advance CEVs will spur efforts to make the diesel engine even better, Tam said. “We will see improved efficiency in diesel engines and reduced emissions because that market does feel threatened, and feel the presence [of CEVs], so they are going to do as much as they can to hold on to the share they have got for as long as they can,” he said.